Color-coated steel plate is produced with cold-rolled steel plate as substrate, galvanized with zinc, zinc-aluminum or nickel etc. Chemical treatment(degrease, phosphate, chromate treatment) is made on the surface. Top coating(roller coating) is applied and then the product is oven cured for color performance. Compared to the traditional product which is painted after forming, the color-coated steel plate has advantages of better coating performance, lower cost, less environmental pollution, and energy saving as well. 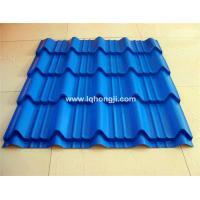 Color-coated steel plate is a kind of combined the steel material with the organic material. It has both characteristic of the materials: good mechanical strength and easy plate forming properties as the steel material; good decoration and corrosion resistance as an organic material. The color-coated steel plate can be widely used in field of building, household appliances, furniture, utilities transportation applications and so on. wooden pallet. Or as you request.